The world’s biggest maker of handsets running on Microsoft Corp’s operating system, HTC (High Tech Computer) has recently introduced its latest smartphone, HTC Touch that consider as one of the most attractive and compact touch-screen PDA-phones to date, which comes with new TouchFLO technology, an intuitive touch-screen navigation technology that makes quick dialing, navigation and selection a breeze. With new TouchFLO screen, it offers a unique way of controlling touch screen-based devices by recognizing and responding to your action whether you’re pressing with a finger or a stylus. This feature is very important so that it can distinguish between you’re scroll through a web page with your thumb, or selecting text in a web page with your stylus. It’s a really cool and intelligent feature which hopes to improve the way and speed people using a PDA. 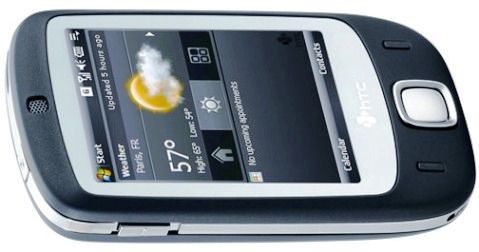 The HTC Touch which features an 2.8-inch (65,536-color) QVGA touch screen, 2 megapixel camera, a microSD slot, 128MB of ROM and 64MB of RAM is measures at 58mm x99.99mm x13.9mm and wights at 112g with its battery. Besides, this smartphone runs Windows Mobile 6 Professional Edition and has support for push e-mail, integrated Bluetooth 2.0 (A2DP supported) and Wi-Fi. The cool and stylish HTC Touch is available in some areas for about $600.